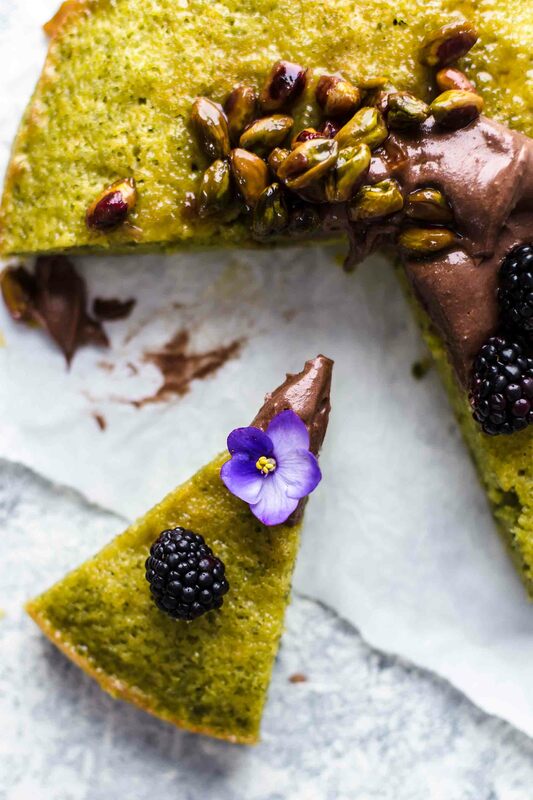 This easy Pistachio Cake recipe from scratch requires just 10 minutes of hands-on preparation time and 10 ingredients. Made with freshly ground pistachios. No artificial colors nor cake mix involved. The added sour cream makes the Pistachio Cake super moist and soft. Instructions for Pistachio Cake Muffins provided. The cake is really, really easy to make. Except for the pistachios, there are just basic ingredients in the cake which are almost always at home. 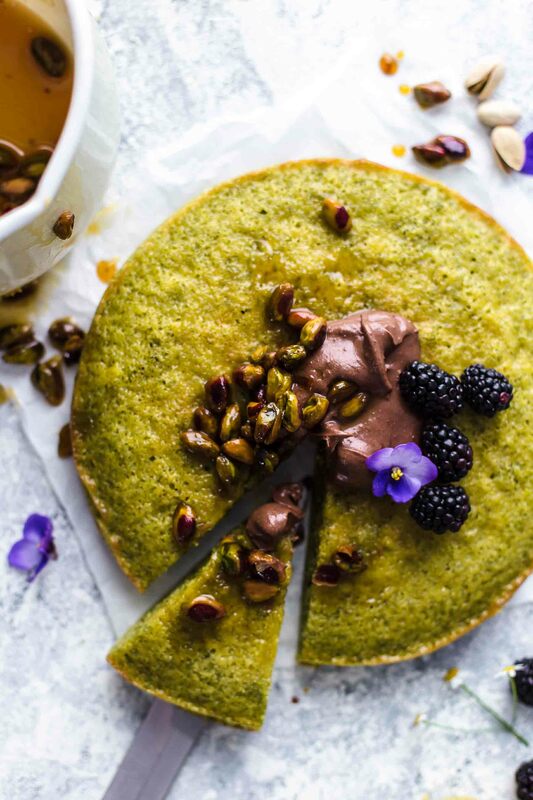 So what exactly is in this Pistachio Cake? You see? Very basic ingredients. Start with the pistachios. I recommend buying roasted, shelled, unsalted pistachios for the most powerful green color. Place pistachios in a food processor and pulse into fine crumbs. Take care that you don’t grind too long. Otherwise, it turns into a paste. Transfer the ground pistachios together with flour, baking powder, and salt to a medium bowl and stir to combine. 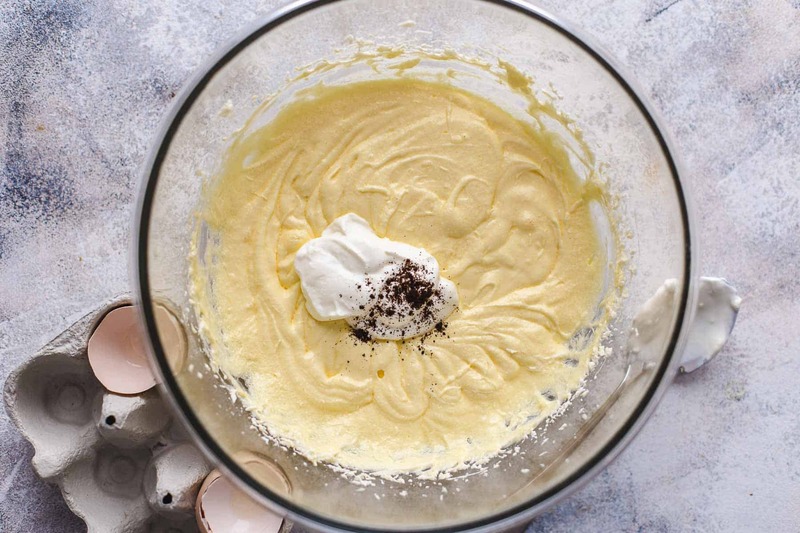 Mix softened butter and sugar until fluffy, pale, and super creamy — about 2 minutes. Add one egg at the time. 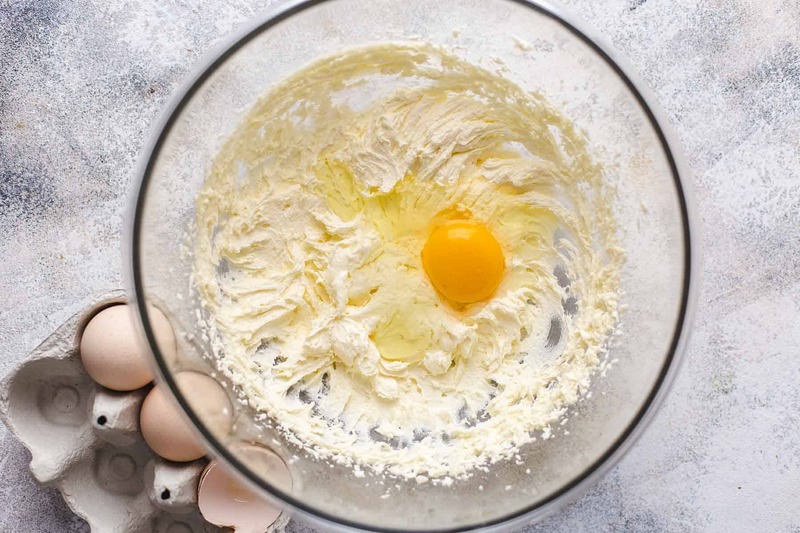 Mix until combined before you add the next egg. Add sour cream and vanilla and stir to combine. Alternately add dry ingredients and milk. Start and end with dry ingredients. 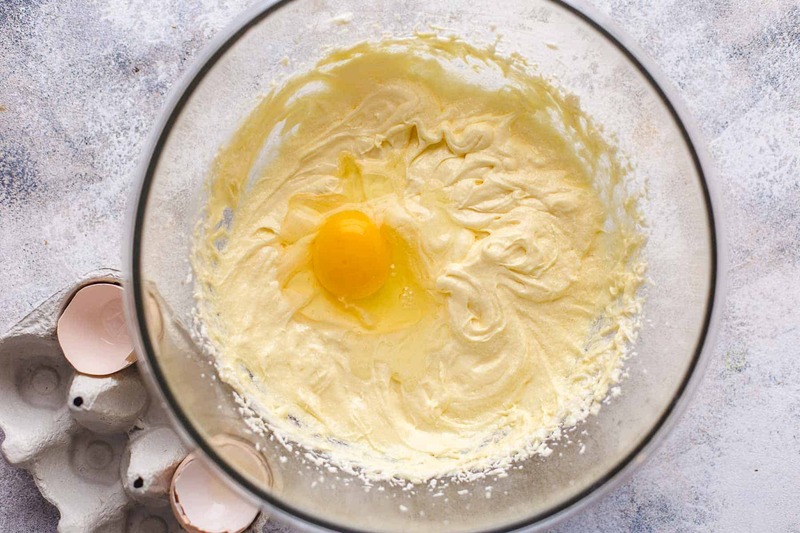 The batter is very liquid. Transfer to a parchment paper layered 9″ baking pan. Bake for 25-28 minutes until a toothpick in the center comes out clean. The cake is very moist, spongy, and loaded with pistachio flavor. Pistachio Cake is best eaten on the second day because it needs a few hours until the taste is fully evolved. 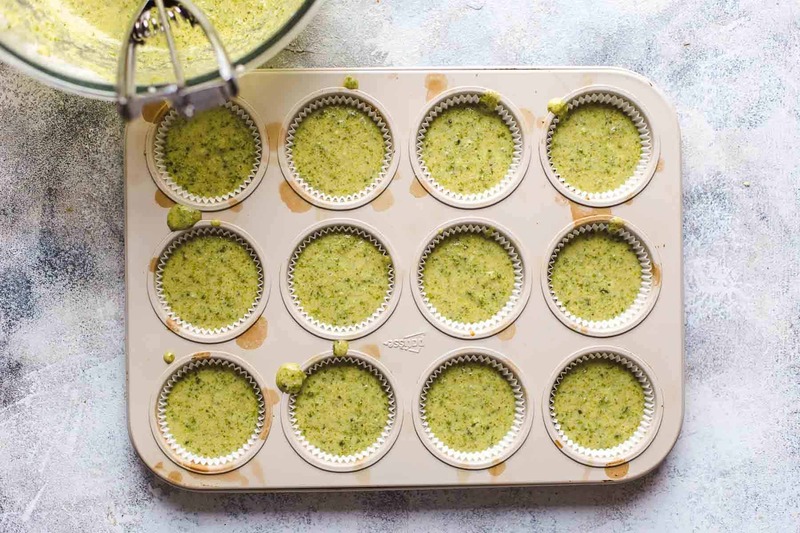 In case you want to make muffins, line two 12 muffin pans with 16-18 cupcake liners and fill 3/4 full with Pistachio Cake batter. This works best with an ice cream scoop or tablespoon. Bake muffins at 425°F / 220°C for 5 minutes then lower the temperature to 350°F / 175°C and bake additional 11-14 minutes or until a toothpick centered in the middle comes out clean. Let the muffins cool completely. As long as they are still warm, they stick to the paper and don’t come off the paper easily. If you let them sit overnight, you can easily peel off the paper. The best frosting for Pistachio Cake is chocolate cream cheese frosting. It is sweet, salty, chocolatey and fits the pistachio taste of the cake just perfectly. If you are not in the mood for chocolate, I recommend a homemade orange pistachio syrup. Orange and pistachio is a great flavor combination. However you decide, I got you covered with both recipes. Here you find the recipe for the chocolate cream cheese frosting which I used. I made just half of the frosting. The whole recipe would be too much for a single layered cake. But if you doubled the recipe and made a double layered Pistachio Cake, you would go with the full recipe. 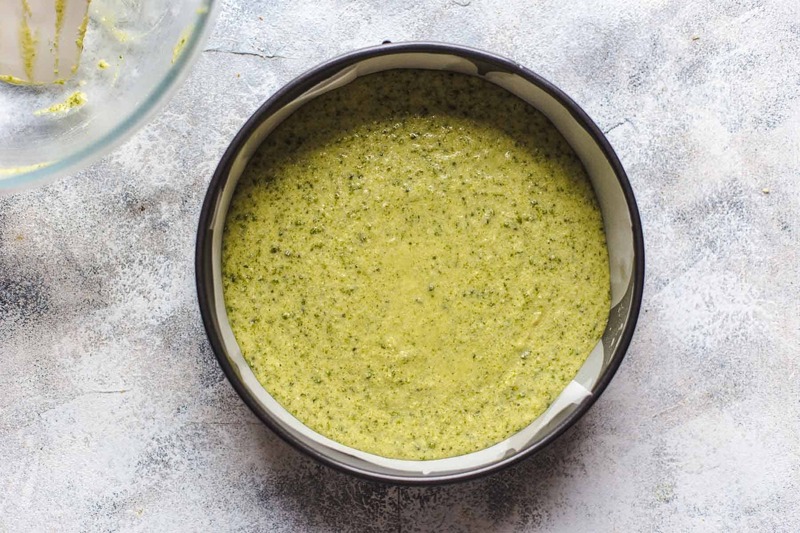 The orange pistachio syrup is super easy to make. Cook roasted, salted, shelled pistachios, sugar, orange juice, and a bit of orange zest in a medium saucepan over medium-low heat until sugar is completely dissolved and the syrup coats the back of a spoon, about 3-4 minutes. Drizzle over the cake just before serving. Store cake or muffins in an airtight container at room temperature. I recommend adding toppings just before serving. If you drizzle the orange syrup over the whole cake, it soaks through and gets wet. If it is very warm and humid where you live, you may want to store the Pistachio Cake (Muffins) in the fridge. Let come to room temperature before serving and add toppings of your choice. Pistachio Cake is always best eaten fresh. However, if you plan to freeze the whole cake, let the Pistachio Cake let cool completely. Then wrap tightly in plastic wrap twice. Then wrap in foil twice. Place the wrapped cake in a large freezer bag and remove as much air as possible. It freezes well up to 1 month. To thaw, unwrap the cake, put it on a wire rack, and let stand at room temperature for 3-4 hours. Then transfer to an airtight container. Eat within 2 days. To freeze single slices, tightly wrap each slice in plastic wrap twice. Then place in freezer bags and squeeze out all the air. Slices freeze well up to 1 month. For thawing, unwrap single slices and place uncovered on the counter for 1-2 hours. 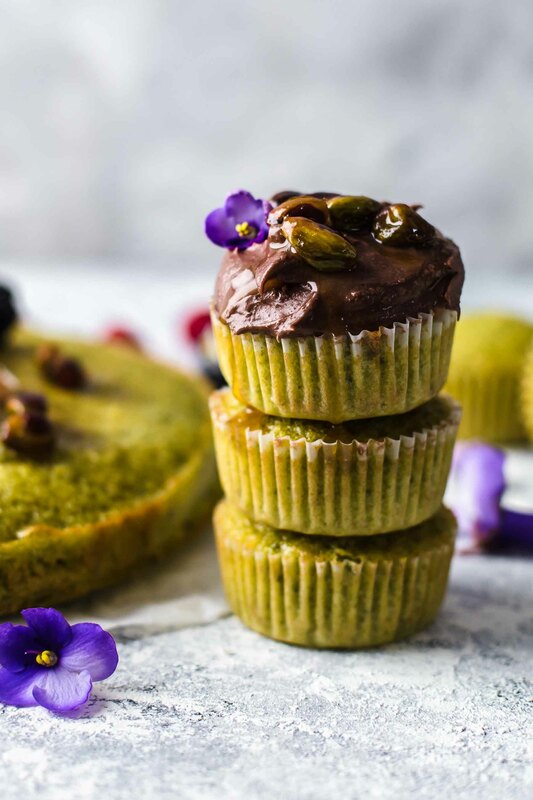 Do the same with Pistachio Cake Muffins. Note: Do not add any toppings before freezing. Otherwise, it gets soggy at the top while thawing. Add toppings just before serving. However, fresh Pistachio Cake is always better than a frozen one. I just want to repeat it. 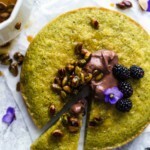 If you make this awesome Pistachio Cake recipe from scratch, rate it and tag a photo #alsothecrumbsplease on Instagram! Would love to see your snap! 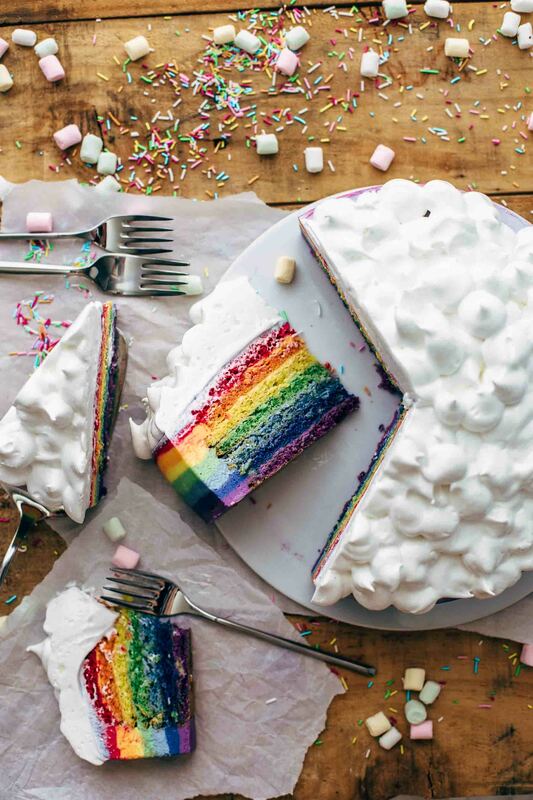 You may also like Hungarian Esterházy Torte Recipe, Mirror Glaze Galaxy Cake Recipe, How to make a Rainbow Cake, Soft and moist Triple Chocolate Cake, or click here to see all recipes. 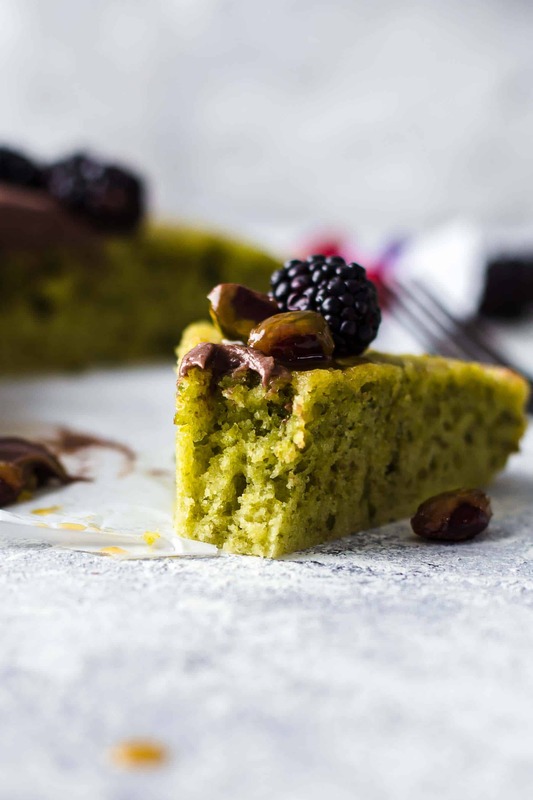 This easy Pistachio Cake recipe from scratch requires just 10 minutes preparation time and 10 ingredients. Made with freshly ground pistachios. No artificial colors nor cake mix involved. Added sour cream makes the Pistachio Cake super moist and soft. Unbelievably easy to make. Preheat oven to 350°F / 175°C. Line the bottom and the sides of a 9" (23cm) springform pan with parchment paper. Set aside. Place pistachios in a food processor and pulse into fine crumbs. Don't grind too long. Otherwise, it turns into a paste. Transfer to a bowl and add flour, baking powder, and salt. Stir to combine. Set aside. 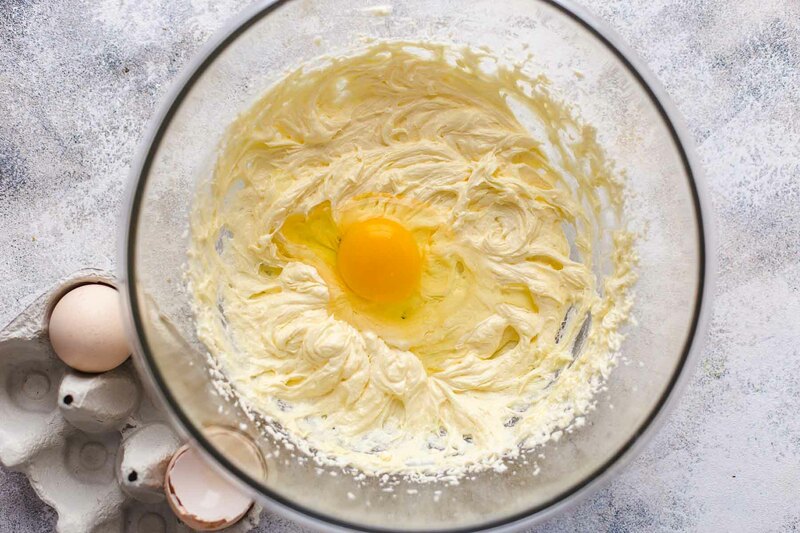 In a large mixing bowl with a stand or handheld mixer fitted with a whisk or paddle attachment, beat butter and sugar until creamy for about 2-3 minutes. Add 1 egg at the time and mix until incorporated. Add sour cream and vanilla* and stir to combine. Alternately add dry ingredients and milk, beginning and ending with dry ingredients. Stir just until combined. Transfer to the prepared baking pan and bake for about 25-28 minutes or until a toothpick in the center comes out clean. Let cool in pan for 20 minutes. Then transfer to a wire rack to let cool completely. 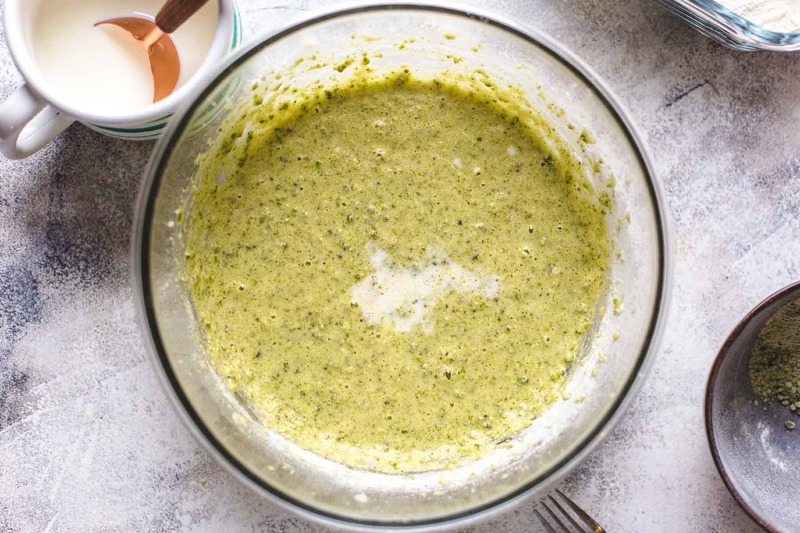 Orange pistachio syrup (OPTIONAL): In a medium saucepan over medium-low heat, cook pistachios, sugar, orange juice, and orange zest until sugar is completely dissolved and syrup coats the back of a spoon, about 3-4 minutes. Pour syrup over cooled cake slices just before serving. Store leftover cake in an airtight container at room temperature up to 2 days. Reheat leftover syrup to liquefy again, if necessary. 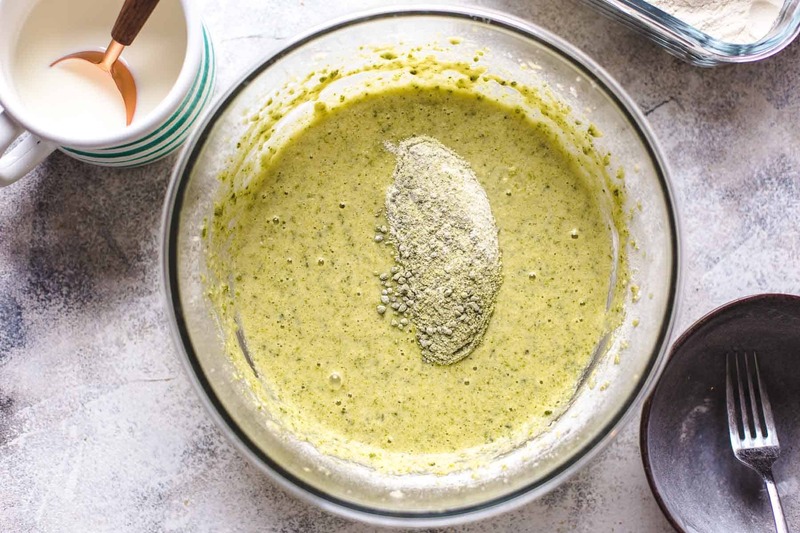 Read the blog post for additional information on how to make, store, and freeze Pistachio Cake, how to convert it into muffins, and which frosting goes with Pistachio Cake. 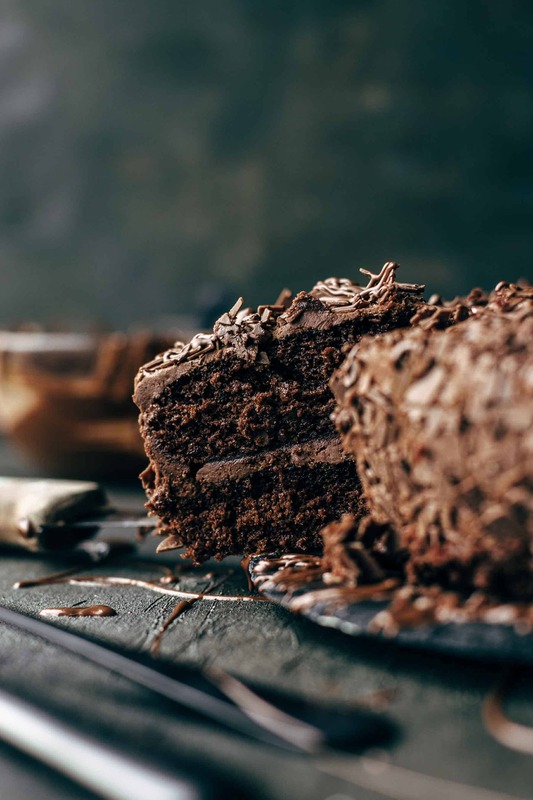 Find here a recipe for chocolate cream cheese frosting. 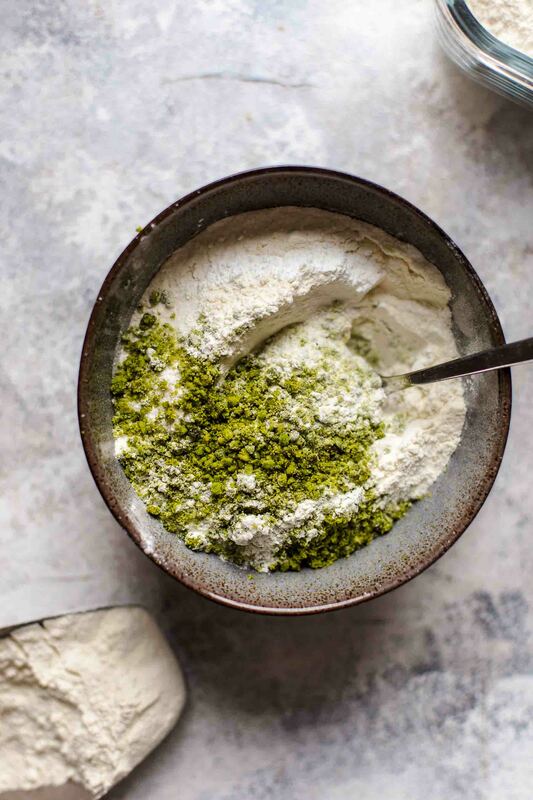 Watch the 32-seconds recipe video to see the whole process of making Pistachio Cake. Im going to make this!! I am going to a womens meet up group and think this will be lovely. I dont have a spring form pan though. Do you think cupcakes would work? I have a loaf pan but i worry it wont be as beautiful or dessert-like. I also have 8” cake pans but will it get stuck? What do you think? I’m not sure about cupcakes because of the baking time. Also, the texture is not that light like cupcakes should be. It is more moist than cupcakes. You could bake them in 8″ cake pans for sure. They will bake slightly longer till they are baked through, just check with a toothpick. That the cake doesn’t stick to the pan, cut out an 8″ circle and about 2″ strips of parchment paper and line the bottom and the sides of the pan. When the cake is cooled, flip over the pan and the cake will come out easily. Then remove the paper and voilá. Hopefully, this helps. Awesome! Thanks! I’ll try it and presuming success I’ll snap a pic, too! Great, Emily! I can’t wait to see it. (: Happy baking! Awww, Joumana! This is so nice. I’m happy that you like this cake. Thank you so much! How do you roast the pistachios ? Hi Teresa, I bought them already roasted. I’ve made this cake several times. It is moist and delicious and people rave when I make it. Sometimes I top it with chocolate ganache followed by the orange syrup/pistachios, and other times just the orange syrup with pistachios. Either way it is a wonderful recipe to keep! I made minicupcakes from this recipe. Worked perfectly!!!! About 14 minutes was enough and they are stil light but moist. I topped them with a creme cheese frosting with vanilla and orange zest en on every cupcake a fresh raspberry to cut throug the sweetness of the frosting. They were amazing !!!! Wow, that sounds beyond delicious, Annemarie. I need to try this. Thank you so much, I’m super happy that you like the recipe! Thanks for the recipe! I made it last night with only one change – I used half vanilla and half almond extract. The cake is good, nice texture, not too sweet. I’d probably do 1/4 tsp salt next time since I use salted butter, and maybe see how it turns out with two eggs instead of three. But overall it’s a nice change from my usual. Thanks again! Yes, when using salted butter, the salt should be reduced. 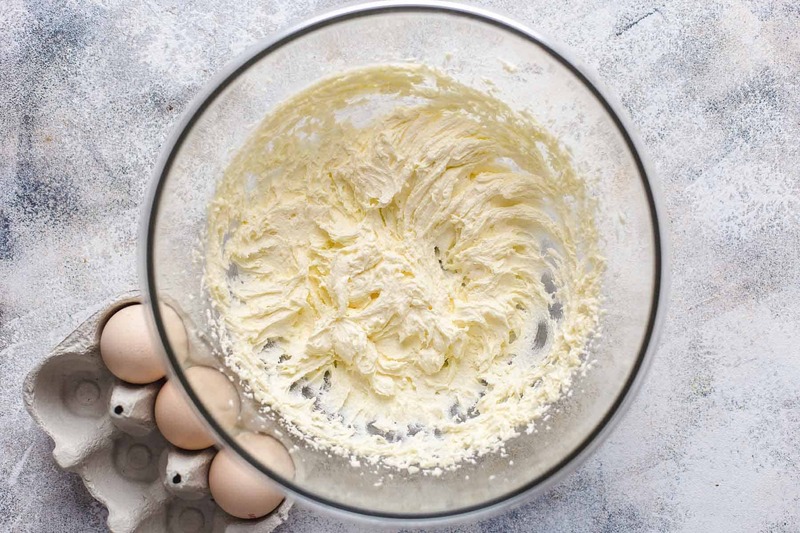 I always use unsalted butter for baking to have full control over the sweetness/saltiness of the baking goods. Thanks for the feedback! 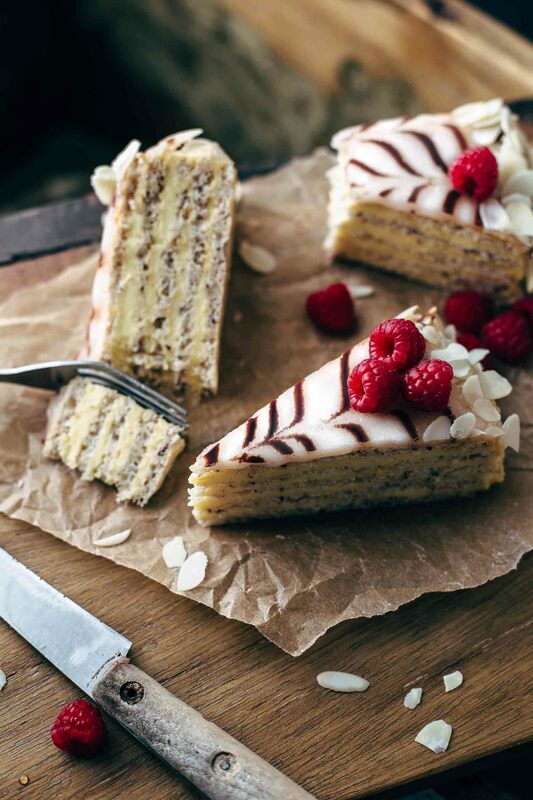 This recipe looks really great… But what changes would I make if I wanted a sheet cake? For a 9×13″ baking pan, I would calculate the ingredients x 1.5. The eggs would be 4.5 but you can go with just 4 eggs. It can be that the cake takes a couple of minutes longer to bake through. I recommend checking with a toothpick. Hope that helps! Ahhhhhh! Thank you for your recipe! I just made the best cake ever. 😀 just swapped the sour cream for yogurt and all purpose for cake flour. 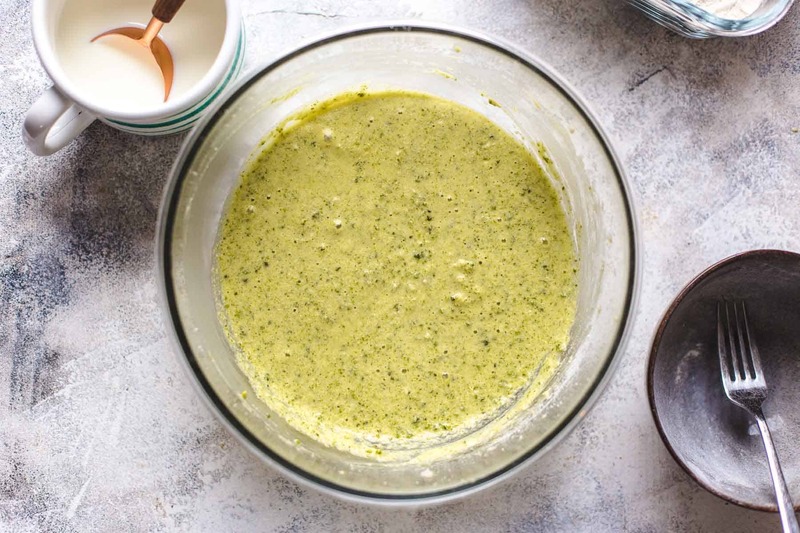 Such a simple recipe that yield amazing results. That is awesome! I’m super happy that you like the recipe. Thank you so much for your feedback! 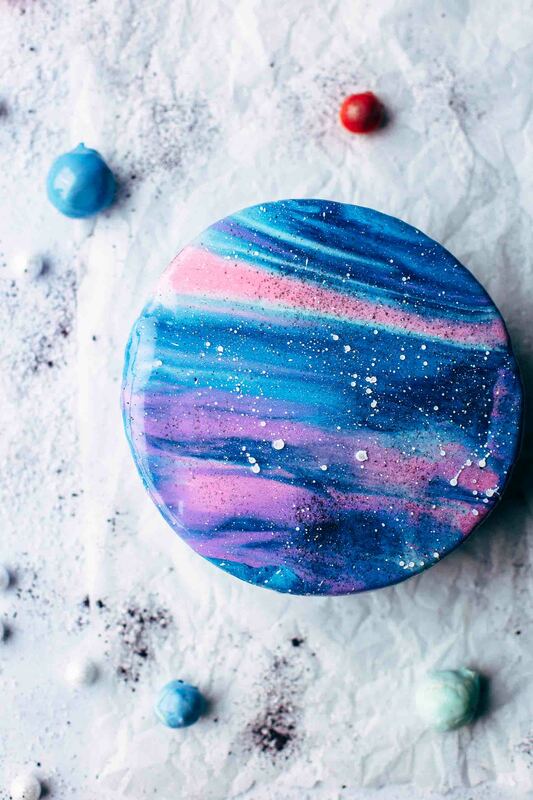 Can I bake this in a 7-inch cake tin? It would work. However, keep in mind that the baking time needs to be longer because the cake is higher. Check with a toothpick. Hope that helps. I made this cake as muffin like a week ago. This recipe is really cook cause it doesn’t use the store bought mix. I accidently left out sugar when I creaming butter, which was a total mistake, hahaha. When I realized that I forgot to put sugar in batter, I already pour the batter into the first batch in the tin, so I added some sugar to each one. I put 3/4 amount of sugar to the rest of the batter, then I baked them. In short, I love both versions. This is so delicious and even less sugar version is delicious, too. I probably make the less sugar version and regular version again. Thanks so much!